In one of the more surreal moments in 'Where Do We Go Now? ', three of the nightclub dancers sit by two of the village women who have engineered their arrival. The Films From the South Festival opened strongly tonight with a real crowd-pleaser. Heidi Sandberg and Lasse Skagen, the festival’s Managing Director and Artistic Director respectively, opened the ten days of screenings and introduced Nadine Labaki, the director, co-writer and star of Where Do We Go Now? As the final credits rolled Ms Labaki received a deserved standing ovation for a film that will no doubt attract healthy audiences across the world following a highly successful opening in France and Lebanon. The film’s title is taken from its last line of dialogue. I won’t spoil your enjoyment by explaining it, but in case you might think that a parting shot like this makes the film sound despairing, I hope you will be assured that it’s actually the opposite and filled with hope – while recognising that the problem hasn’t been solved yet. I’ve been mulling over the various genre descriptions of the film such as ‘musical comedy’ and the inimitable Variety ‘dramedy’. I was surprised that there is a moment of real tragedy in the film. This definitely changes the overall tone of the film, sharpening up the comedy and adding to the real satirical edge which is there in the film underneath all the music and laughter. Where Do We Go Now? is clearly a follow-up to Labaki’s earlier Caramel, but also something ‘bigger’ in cinematic terms. Its use of music helps to propel it away from the more realist tone of the earlier film and towards something more fantastical. Although most reports set the film in Lebanon, there aren’t any direct references to that country. It could really be set in any relatively isolated community. In this case the village is in the mountains, linked only to civilisation by a narrow track that is heavily mined on either side. The two teenage sons of the shopkeeper take their ‘scooter and trailer’ down the mountain each day to collect supplies. Meanwhile the women visit the village’s twin cemeteries, Christian and Muslim, replacing the flowers on the graves of husbands and sons lost in a civil war between sectarian groups. When the boys set up a new aerial on the hillside it brings both music radio and television channels to the village which gathers to usher in the millennium. But television also seems to bring seeds of discord, partly through the news of what is happening elsewhere in the country and partly through the sexualised imagery which inflames the passions of the men of all ages. Perhaps fittingly, the village women will eventually use sexual allure (in the form of a group of Ukrainian nightclub dancers) as a decoy device in order to prevent the men from reaching the inevitable conclusion of an outbreak of the civil war directly in the village itself – and that’s where the comedy comes in. There are two main differences between this film and Caramel as I see it. The first is the scale of production. With more co-production partners, including support from both Canal + and the Doha Film Institute as well as Pathé (the international sales agents who will also distribute in much of Europe), the film was genuinely international and the budget was forecast as $6.7 million (Variety November 2010). I suspect that is quite large by Lebanese standards. I’m not sure if it was significant in attracting cinematographer Christophe Offenstein (who lensed the two Guillaume Canet Fims, Tell No One and Little White Lies). He certainly makes good use of the CinemaScope frame in the opening musical sequence and creates plenty of excitement in the composite village scenes (which were shot in three different Lebanese villages, one of which has its church and mosque close together). Despite the bigger budget, Labaki decided to stick with her original decision to use non-actors in most roles. I was sure that I’d seen some of the actors before but I was wrong. That’s a tribute I think to Labaki’s skill in moulding the performances of a large cast of non-professionals into such a wonderful ensemble. The second difference is the injection of what Labaki calls “a mood of fairytale and fable” – via the use of music. I’d like to tell you that she drew on Indian popular cinema or Egyptian melodramas but she told her Cannes interviewer that it was Grease and the Disney animations Snow White and Cinderella that originally inspired her. The music is written by Labaki’s partner Khaled Mouzanar and the writing process is quite an organic part of writing the film. The words are by Tania Saleh and I’d like to listen to the songs again. I do think that the film feels oddly ‘universal’ and I thought of lots of other similar narratives from Greek tragedies and fairy tales to one of my favourite Cuban films, The Waiting List (2000) about a community of travellers trapped in a country bus station who create a kind of utopia. 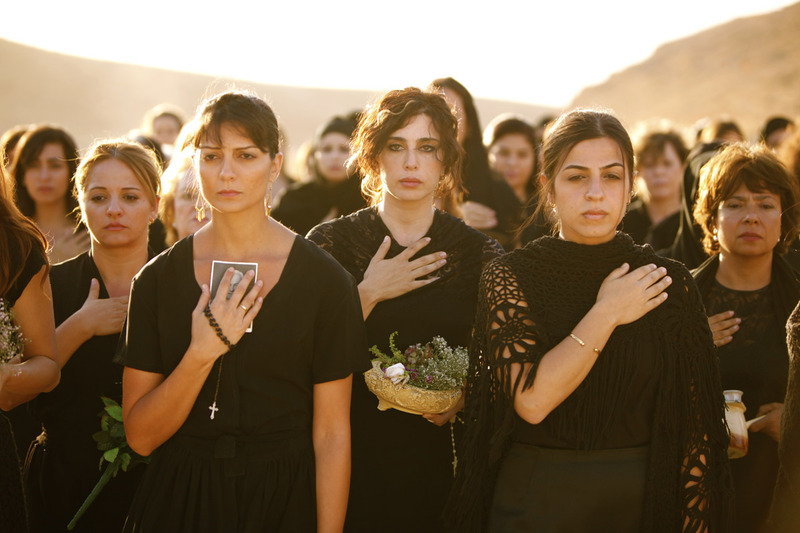 In Nadine Labaki’s film her isolated community in a sense create a fantasy about a world in which people work to avoid wars and to live with difference – now that is a political idea, isn’t it? Download the Cannes Press Pack (pdf) here. Unfortunately I couldn’t make the Q&A or the Press Conference given by Nadine Labaki in Oslo, but I hope to have more luck with the next festival guest, Eric Khoo from Singapore, whose films I’m seeing tomorrow. Cineuropa ran a piece today on this festival, pointing out that there is a new initiative from Films From the South and the Norwegian Film Institute to set up a ‘South Fund’ encouraging co-productions between filmmakers from the South and Norwegian partners. The Norwegian government has pledged €1.3 million over 5 years and 13 potential projects have been selected for a forum to be held during this festival. Oslo’s unique film festival celebrating films from Africa, Asia and Latin America opens on Thursday October 6 and we’ll be there to cover the first five days. The festival programme presents nearly 100 films organised in sections: ‘Main Competition’, New Horizons, Doc South, Asian Visions, Latin American Style, African Stories and Middle East Without Borders. The ‘Critical Room’ gives an opportunity to meet some of the directors featured in the documentary strand, focusing on Brazil and Afghanistan, and there are four directors given a showcase within the overall programme: Asghar Farhadi (Iran), Eric Khoo (Singapore), Matias Bize (Chile) and Fernando Pérez (Cuba). There is also a children’s section (this year exclusively animation) and an associated film education programme (dealing with films about Afghanistan) that takes film screenings beyond Oslo and into other areas of Norway. With associated art and music events, Oslo looks like a buzzing place over the next couple of weeks – can’t wait! The women of a village threatened by war in Where Do We Go Now? The opening film is Nadine Labaki’s Where Do We Go Now? in which the Lebanese director offers a comedy-drama about how women can prevent men from going to war. Ms Labaki is the main guest of the festival and will present her film in person. This is perfectly timed as, after winning the audience prize at Toronto, Where Do We Go Now? has just opened as the biggest Arabic language film in Lebanese box office history. Following her earlier international hit Caramel, Where Do We Go Now? reinforces the emergence of a new kind of female identity in a region galvanised by the ‘Arab Spring’ – something picked up elsewhere in the festival with recent films from Egypt and Morocco. Watch this space for our verdict on Where Do We Go Now? Mohamed Al Daradji was, as he told us, born in a poor part of Baghdad. He trained as a filmmaker in Hilversum in the Netherlands and in Leeds where he later founded Human Film (which also has a presence in the Netherlands and in Iraq). He was actually making his first film Ahlaam (Dreams) (2006) in Baghdad when he had the idea for Son of Babylon. The film has a very simple story. 12 year-old Ahmed travels with his grandmother, south from the Kurdish area of Northern Iraq to Baghdad in 2003 in search of his father Ibrahim who has been missing since the Gulf War in 1991. 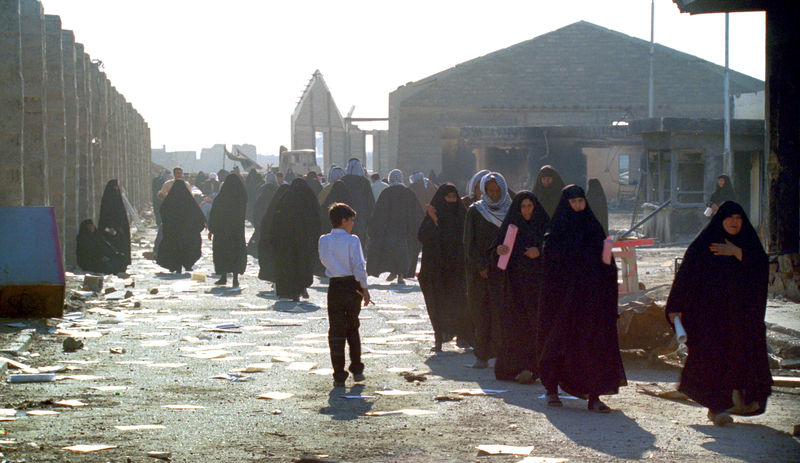 From Baghdad they travel on to a prison and then further south to check the mass graves that are being opened in the aftermath of the fall of Saddam Hussein. Al Daradji, in a Q&A downloadable from the Human Film website, has spoken about the influence of both Rossellini and Italian neo-realism in the late 1940s as well as more recent Iranian Cinema on his work in Iraq. I was certainly struck by the Rossellini comparisons and by the similarities between the Baghdad street scenes and images of Afghanistan in the work of the Makhmalbafs. 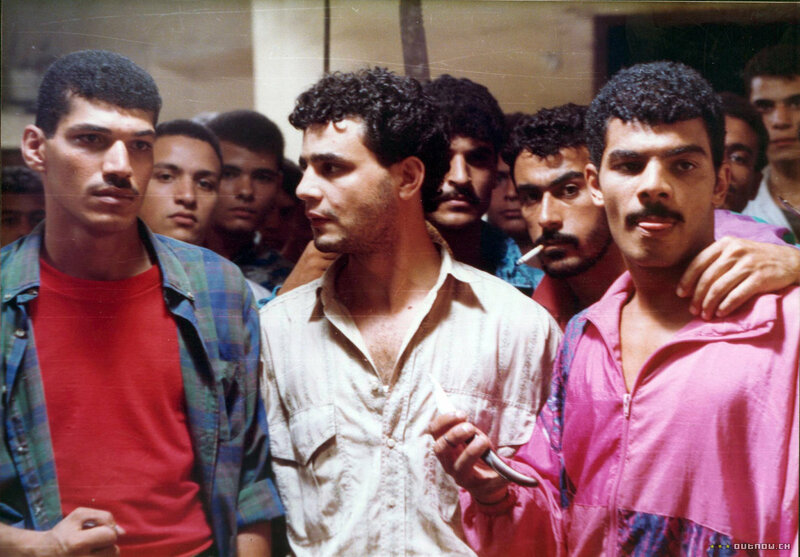 Following the neo-realist approach, Al Daradji searched for non-actors for all the roles in the film. He filmed on location in six different Iraqi cities and took his story from ‘contemporary life’ or “from the world” as Rossellini suggested. The whole process was extremely difficult, not least because of the problems in getting footage sent back to the West for processing. Not surprisingly, Al Daradji says that he formed a close bond with his actors, especially the young boy whom he has since ‘mentored’. The neo-realist approach has also caused other problems. The film’s ending is bleak – just like the prospects for many Iraqis. There is no attempt to fictionalise the ending by hinting at an optimistic future for the boy. Instead, the narrative effectively ends with the facts about the numbers of ‘missing’ in Iraq. This includes not only the 1 million and more lost in the three wars since 1980 but also the more than 150,000 since the fall of Saddam Hussein. 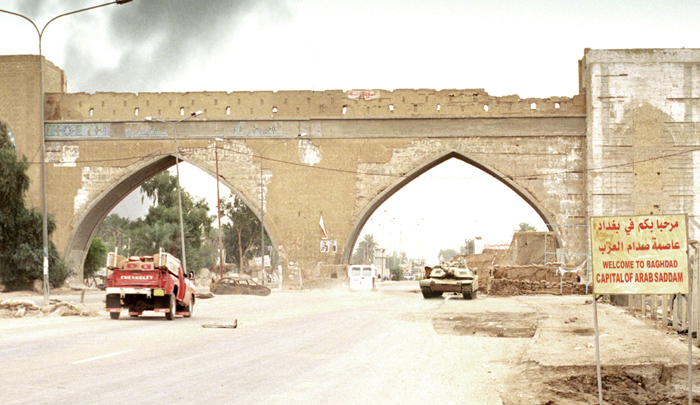 The filmmakers have set up a campaign group with a UK base and charitable status: Iraq’s Missing Campaign. They have also started a petition which you can sign online. The website suggests many other ways to help – including help in promoting the film and I’m certainly willing to do that (but please persuade Dogwoof to get their act together!). Either of the two websites above will lead you to information on the film and the campaign. I found the film gripping but painful to watch. The poor quality of the image in this particular screening means that I can’t comment on whether a more ‘beautiful’ image would have an effect on how an audience responds. The lack of a ‘happy ending’ is not a concern of course but there are always going to be questions about how to handle the emotional response that films like this generate. The filmmakers have attempted to channel that emotion into support for their campaign and that seems the right thing to do. I have no direct knowledge of Iraq and therefore took what was offered at face value. However, after the screening I met a friend who was in Baghdad in 2003 (in a humanitarian aid capacity, I think). She pointed out that the street scenes shot in 2008 did not really represent how Baghdad looked in 2003 – in particular, the women in 2003 were dressed in much brighter clothing and were not routinely ‘covered’ to the same extent. If this is true it does undermine some aspects of the presentation. My friend also commented on the Kurdish elements of the story, suggesting that there were problems in giving the audience information about Kurdish culture in an artificial way in the dialogue. I don’t think that there is much that could be done about this – the audience for the film in the West would probably be lost without some explanation of Kurdish history. However, it does raise an interesting question about any assumptions we might have about Iraqi culture and the position of a distinctive separate community within the country. Al Daradji himself is an ‘outsider’ in terms of the Kurdish community and his discussions with his actors involved considerable amounts of translation. Of course, it would be good to know what the Kurds in Iraq thought about the film. Al Daradji was able to tell us about the screenings he held in the country (which now is without functioning cinemas as such) and unsurprisingly they were very well received. You can read about the screening in Baghdad in a Guardian interview and the film has I think now been shown in other parts of Iraq using mobile cinema kit. A DVD release accompanied the film into UK cinemas and I’d urge you to rent or buy the DVD (or watch it online) and support the campaign. Production Notes and more on the film from Dogwoof. Cinema has an important role to play in telling stories like these from a personal perspective. Al Daradji has said that he feels that his film offers a distinctively alternative view of Iraq to those of the US/UK broadcast media. If this film’s relatively low-key UK release has slipped under your radar, I urge you to sniff it out and go see. Undoubtedly one of the films of the year in the UK, it claims to be 130 mins long but it seemed like 90 mins. I was gripped for every second. It is a powerful film that often achieves its impact by understatement – but still leaves you awestruck at the end. The narrative is partly a mystery so I’ll avoid spoilers. The set-up is something like a Wilkie Collins narrative. After a pre-credit sequence set somewhere in the ‘Middle East’ (or ‘the Levant’ as the French used to call it) the narrative switches to Quebec where twins Simon and Jeanne are sitting before a notary who is reading their mother’s will. She was his secretary in the legal practice so the notary feels almost like family. It is a strange will which involves each of the twins being given a letter. One is required to find another sibling who is unknown to them. The other is required to find the father they had assumed was dead. The narrative then unfolds in parallel strands – one relating the events as the twins travel (separately) to their mother’s native country and the other via flashbacks revealing some of the various terrible events that the mother experienced directly. The country and the history are never identified. The film was shot in Jordan but the nature of the events (Christian-Muslim conflict in a civil war) suggests Lebanon. The film doesn’t attempt to explain anything about the war as such. It is simply ‘shocking’. The reviewer for the World Socialist Website finds this problematic. I agree that the war does need to be contextualised in terms of anti-Imperialist struggles, but I think a filmmaker should be allowed to focus on a personal history – and in any case, the conflicts of this region are highly complex and can’t easily be explained in global political terms. The original ‘property’ was a stage play by Wajdi Mouawad who left Lebanon as an 8 year-old in 1976, initially for France but then for Montreal. His play has been performed and very well received around the world. The four central characters are all exceptionally well-played by three Canadians and Lubna Azabal who is the Belgian-born daughter of Moroccan and Spanish parents. She’s probably best known as the ‘exile’ in the Palestinian film Paradise Now (2005). I’ve seen a complaint about her ‘Moroccan Arabic’ but that seems a pointless remark about a character in a film where her native country is not identified. (She presumably also speaks French with a Belgian not Montreal accent, but so what?) Anyway, she is sensationally good, especially since she must age 30 years. It’s a performance not to be missed – like the film. Sight and Sound made this its ‘Film of the Month’ in July 2011. The same issue includes an interview with director Denis Villeneuve. (Sony) Official website with Press Kit etc.